I’ve known Tammany and her awesome team for a few years now. Since the very first meeting with Tammany and her staff, our visits have always been very welcoming and professional. On my initial visit I wanted to have a coin developed for our unit that represented what it is that we encounter on a daily basis; placing emphasis on the vice’s that plague society. After several meetings with Tammany, we developed our SAPD Vice Unit Coin! I didn’t know it at the time, but Tammany would later advise me that our coin was the first Vice Unit coin (known of) in the United States. Everyone we come in contact with that has seen our coin has nothing but great things to say about it and the excellent workmanship. Since then, I’ve trusted Tammany and her amazing staff in making several plaques for a few of our Detectives that had retired in the last few years. 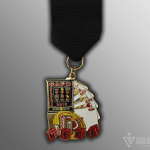 Just this year, we added the first Vice Unit Fiesta medal! So far it’s been very well received. (Yes, Tammany was right again!). Thanks to Celebrate Excellence for the wonderful work you guys do!